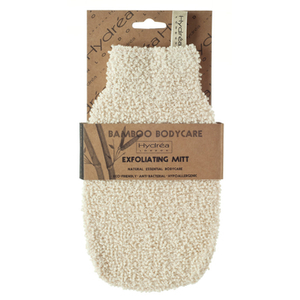 Hydrea London's Bamboo & Loofah Exfoliating Sponge combines the luxury of a sponge with the exfoliating benefits of a loofah. Perfect for all-over cleansing, the hybrid offers a silky soft, eco-friendly bamboo sponge to create a luxurious lather, and a stimulating loofah to expertly exfoliate skin; sloughing away dead skin cells whilst boosting circulation for brighter, more refined-looking skin. Rinse after use and allow to dry naturally. The loofah is built well but you can’t make any lather with it.